Want to become a licensed Customs broker? If you want the license, you have to pass the US Customs broker exam. This exam is one of the most difficult to pass in the USA. There are roughly 2,600 examinees a year who take the exam, and only around 15% are able to pass. Most examinees will need to take a prep course in order to pass. No matter how much experience a person has with import compliance, real world application does not guarantee a passing grade. There have been lawyers who have taken the exam multiple times before passing and there have been people who have never worked import compliance and passed on the first go. Because of how difficult the exam is, Imports Academy provides a robust US Customs broker exam prep course to help anyone pass. Topics typically cover classification, valuation, trade agreements, entry, broker compliance, power of attorney, marking, drawback, bonds, foreign trade zones, warehouses, fines and penalties, and intellectual property rights. Ideally, examinees should start studying for the test somewhere between 10 to 12 weeks before taking the exam. The most important part of studying for the exam is taking practice tests. An even better approach is taking timed tests that simulate the real exam. If you are able to carve out 4.5 hours on a Saturday or Sunday, you will get a better feel for the actual exam. Aside from just taking practice exams, you will benefit even more from taking a prep course. The Imports Academy prep course will guide you through the exam categories and focus on the most relevant information. Can you memorize the material? Simple, you can’t, in fact no one can! 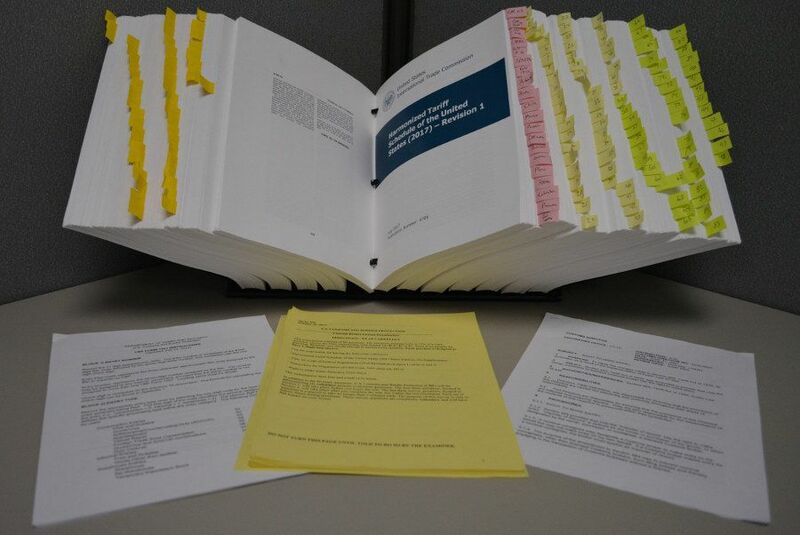 There are over 2,000 pages of regulations in the 19 CFR. Unless you have a photographic memory, do not waste any time trying to memorize all the timelines, forms or regulatory requirements. Not to mention, it is impossible to memorize the harmonized tariff schedule catalog. Examinees who know how the regulations and HTS catalog are structured have the best chance to pass the exam. By learning how to navigate both the 19 CFR and HTS catalog quickly, you will be able to answer questions much faster. If you sign up for the Imports Academy prep course for the US Customs broker exam, you will receive quick reference guides that you can use during the exam as well as study guide printouts for each lesson. You can take these into the exam with you! These have proven to be critical when taking the exam, quickly finding the answers on our reference guides helps you spend more time on other questions. The Notice of Examination for the Customs Broker License Exam published on CBP’s website where you can register for the exam. Due to the new “Modernization of the Customs Broker Exam” that was published on June 30, 2017, the exam format is now administered on computers. The exam registration fee now costs $390 and you must pay online via the pay.gov. Once you have paid you will receive a confirmation email from pay.gov with a tracking number for confirmation, keep this for your records. Select the port closest to your home address, the testing area will be located close by. Once upon a time, not long ago, you had to take the exam on a Scan-Tron. Now with the new exam modernization act, the exam is administered on a computer. This can add an extra level of stress! Instead of having a booklet with all the questions in front of you, the test is administered one question at a time. While you can skip around from question to question, it may seem more difficult without a physical document to skip around in. Once you have passed the exam you will still need to apply for the actual Customs broker license. CBP will mail you a response telling you what your examination score. Within 60 days receiving the letter, CBP will mail you the official application on CBP Form 3124. You will have to provide a current credit report, processing fees and fingerprints. Customs allows 3 years from the date of the letter to apply for the license. While relatively unknown outside of the global trade community, people who have taken the exam consider it one of the hardest to take. For exam, the Series 7 exam has around 65% pass rate, the Bar Exam is around 59% and the Chartered Financial Analyst exam has around a 47% pass rate. On average, the Customs broker exam pass rate is roughly 15%, some exams have had an estimated pass rate of only 2%! However, do not let these numbers discourage you. Anyone can pass; all you need is dedication and an understanding of how to take the test. Preparation is key! The Imports Academy prep course for the US Customs broker exam is specifically designed to help you learn the key elements to passing the exam. Our course is broken up into all the main categories covered by the exam as well as quizzes, interactive modules, reference guides and timed tests. Start the prep course today!